GreatDomains (powered by Sedo) June 2010 online auction starts today and runs until 06/24/2010 Noon EST. Listed below are several .com product domain names from the current auction list. About half of all the domains in the auction already have bids. GreatDomains (powered by Sedo) May 2010 online auction runs until 05/27/2010 Noon EST. Listed below are a couple .com product domain names from the current auction list. There are many .net product domains in the auction as well, if that is your flavor. The next few weeks should be exciting times for domain buyers and sellers alike. 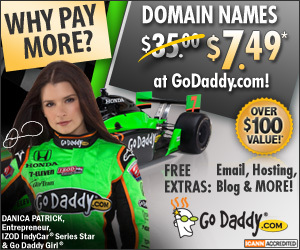 There are 4 large domain name auctions starting this week and continuing through February 2010. The details and dates for each auction are outlined below. GreatDomains (powered by Sedo) December 2009 online auction has started and runs until 12/10/2009 Noon EST. Listed below are a few product domain names from the current auction list. GreatDomains (powered by Sedo) October 2009 online auction has starts 10/15/2009 at Noon EST and runs until 10/22/2009 Noon EST. Listed below are a few product domains from the current auction list. GreatDomains (powered by Sedo) 25th online auction has started and runs until 09/24/2009. Listed below are a few product domains from the current auction list.